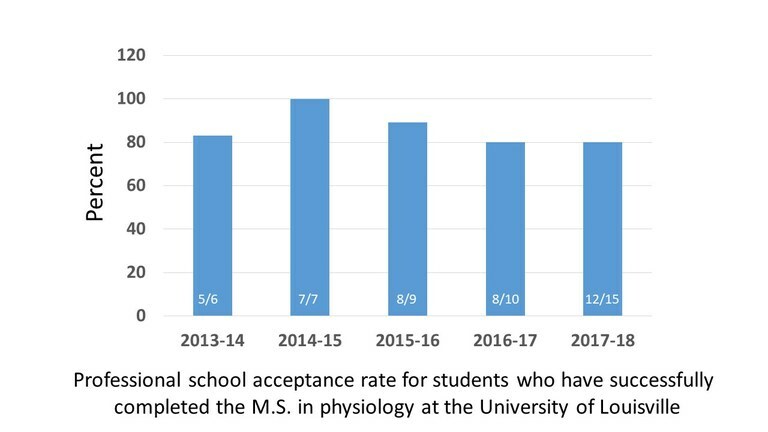 The Department of Physiology is located in the Health Sciences Center of the University of Louisville which provides our graduate students with an active and intellectually stimulating environment. Our Graduate Program offers a Master of Science Degree to provide several career options. The Pre-HealthCare concentration is for students who wish to enhance their credentials for admission to and performance in professional healthcare programs. The Research concentration is to: 1) develop competence in directed research for advanced technical positions in industry, government, and university medical research laboratories; 2) prepare students with a good general knowledge of human physiology to enable them to communicate physiological concepts to future students; and 3) explore the possibility of a future career as an independent scientist in medically-related research. The typical Master of Science (M.S.) Graduate Program consists of thirty (30) semester hours typically over a twelve-month (3 semesters) period to include the following: 18 credit hours of physiology and biochemistry and at least 12 credit hours of electives. The University of Louisville School of Interdisciplinary and Graduate Studies (SIGS) catalog gives a general description of admission procedures. Application information can be found on the SIGS website (www.graduate.louisville.edu). The following application items must be submitted to the Graduate School Admissions Office at the University of Louisville. One official transcript of the applicant's previous work for each college or university that has been previously attended. At least two letters of recommendation from people who are well acquainted with the applicant's previous academic work. Applicants must forward scores from the Analytical, Verbal and Quantitative portions of the Graduate Record Examination (GRE). Professional school admission tests may be used instead of the GRE. TOEFL Examination scores for foreign students from non-English speaking countries. A non-returnable application fee to the University of Louisville. Applicants must state in a letter to the Department but submitted to the SIGS (referred to as the Personal Statement in the application materials), why they desire a M.S. degree in this Department of Physiology. A Graduate Record Examination Score which usually averages at the 40th percentile or higher in the verbal, quantitative and analytical sections. In the case of a foreign applicant from a non-English speaking country, the applicant must achieve a TOEFL Examination score of 550 (paper) or 213 (computerized). Two committees will manage student admission into the Department Graduate Programs. The Graduate Program Executive Committee (GPEC) and the Graduate Admission Committee (GAC). Refer to Appendix A for details of composition and function. The GPEC will determine if an applicant should be voted on by the entire admissions committee; interviewed prior to a determination of a vote; or not eligible for the program. The Director of Graduate Studies will meet with the new student to discuss the academic and research interests. The Director of Graduate Studies will serve as a Temporary Advisor until a Permanent Advisor is selected. During the first semester of their graduate study, Research concentration students visit research laboratories in which they have an interest. First-year students must select a principal advisor. The selection process involves approval by the student, the Principal Advisor, the Director of Graduate Studies, and the Department Chair. The Director of Graduate Studies will serve as the Academic Advisor for students in the Pre-HealthCare concentration. At least 30 semester hours beyond the Baccalaureate Degree are required for the degree of Master of Science. A maximum of 6 semester credit hours (CH) may be creditedfrom post-baccalaureate work in other professional or graduate degree programs. A student must have at least a 3.0 accumulated GPA to be graduated with a degree of Master of Science in Physiology. In general, a student with a GPA that is less than 3.0 at the end of the second semester will require a 2/3 majority vote of the Departmental faculty to continue in the Program. A student may not be graduated with more than 6 CH of “C” grades in their required courses. The Research concentration M.S. student will take a Final Examination during the last semester of the M.S. Program. The Final Examination shall consist of an oral presentation. This exam may take the form of a presentation of the research experience or a detailed review of a selected topic. The Pre-HealthCare concentration M.S. student will be given a final as part of the Clinical Physiology course during their last semester. Two letters of recommendation from people who are well acquainted with the applicant's previous academic work. Applicants must forward scores from the Analytical, Verbal and Quantitative portions of the Graduate Record Examination (GRE). Applicants must state in a letter to the Department but submitted to the SIGS (referred to as the Personal Statement in the application materials), why they desire a M.S. degree in this Department of Physiology and Biophysics. A cumulative undergraduate grade point average that is usually 2.80 or higher on a scale of 4.0 (A=4, B=3, etc.). Satisfactory MCAT scores will also be accepted in lieu of the GRE. In the case of a foreign applicant from a non-English speaking country, the applicant must achieve a TOEFL Examination score of 550 (paper) or 213 (computerized). Two committees will control student admission into the Department Graduate Programs: The Graduate Program Executive Committee (GPEC) and the Graduate Admission Committee (GAC). The GPEC will make recommendations to the GAC concerning applicants based upon a dossier of information obtained from the Admission Office of the School of Interdisciplinary and Graduate Studies (SIGS). The GAC will conduct student interviews when recommended and will vote on admission as representatives of the entire faculty of the Department. The GPEC will consist of the Director of Graduate Admissions, the Director of Graduate Studies, and one other Departmental faculty member, all of whom are appointed by the Departmental Chair for staggered five-year terms. The GAC will be composed of three tenured or tenure-track Department faculty members and members of GPEC, for a total membership of six. The full-time faculty of the Department will elect the three faculty representatives to GAC for staggered three-year terms. Two to three members of the GAC. If the applicant cannot come for an interview, then consideration of the application will proceed without the interview, or in some cases, by telephone interview. The Director of Graduate Admissions will create a summary of the applicants academic background and interview results (i.e., the GPEC Report). This document and the complete dossier will serve as basis for admission or denial. The GAC considers the GPEC Report and complete dossier and votes on admissibility of each applicant. Student admission will require a simple majority recommendation from GAC. The recommendation of GAC is forwarded to the Director of Graduate Admissions. Completion of the admission process is accomplished by submission of a Referral Form to SIGS and delivery of the GPEC Report and complete dossier on admitted students to the Departmental Office. The Referral Form will initiate an acceptance or denial letter to the student. The GPEC Report and the complete dossier becomes the Department File on the admitted student and are transferred to the Director of Graduate Studies. When an applicant is accepted into the Department Graduate Program, The Department Chair will send a letter of acceptance. The prospective student must provide a letter indicating their acceptance of admission to the Department Graduate Program.